Twelve months have gone – where! I can not believe that it has been twelve months since I added anything to my yarn blog. Amazing how the time just flies when you plan a large move overseas. We made the decision to move back to Australia after 14 years in the USA to be much closer to my elderly parents. It is a move we completed in February this year and when our cats arrived safely from quarantine at the end of March our lives were complete again. Our worldly belongings are on the ocean somewhere and that does include all of my knitting stash and of course our furniture and other household goods. Original date of arrival was May 5th which was then brought forward to April 18th, but regardless of the docking date for the ship, customs could delay the delivery by up to three weeks. I have a dear cousin living in Adelaide and the first thing she asked when we were reunited at the beginning of March was, will you knit me a couple of cardigans please? 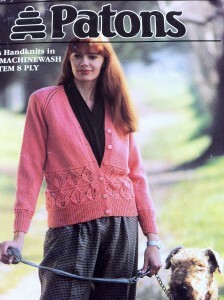 This was the pattern I chose for Jan from my Mum’s collection of pattern books. Jan wanted something just a little bit fancy, but definitely no lace. So I think this fits that criteria nicely. 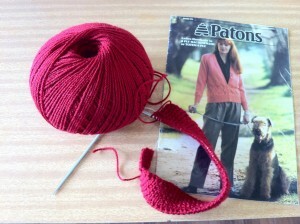 Jan chose the yarn from a new colour card by Bendigo Woollen Mills in Victoria Australia and it is their Classic machine washable DK (8ply) weight and the colour is called Brick Red. After doing a swatch last night I cast on for the very smallest size on a 3mm circular needle that Mum found in her knitting supplies. 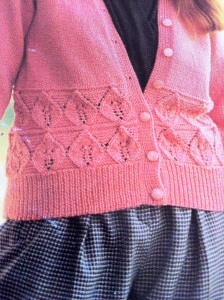 I have used this yarn before and it knits and feels beautiful on the needles. With Fall well and truly here in Australia and winter officially beginning in June I would like to have at least one new cardigan for her before the weather starts to get very cold in South Australia.